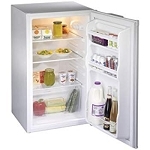 ICEKING RZ109AP2 48CM UNDER COUNTER FREEZER - OUR LOWEST PRICED UNDER COUNTER FREEZER..
ICEKING CH1042W CHEST FREEZER - IDEAL FOR EXTRA STORAGE. 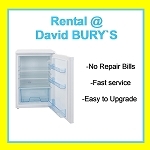 Fridges and freezers is a pretty varied category as it covers everything from table top fridges and freezers to tall upright models with multiple shelves or freezer drawers and of course the popular chest freezer. 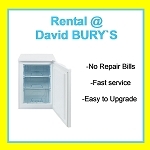 We find that customers often want to have additional freezer capacity in their garage or outbuilding in which case we recommend that you choose one of the models that we have marked as 'suitable for garages'. 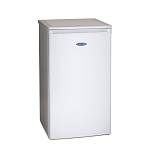 These models are ones that are actually guaranteed by the manufacturer to be suitable in the colder conditions that can be found in these types of locations and in fact Beko will guarantee their 'garage safe' products down to external temperatures of minus 15 degrees celcius, I'm sure you will join me in hoping that we don't have to endure that sort of cold anytime soon! 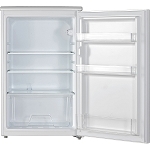 Various manufacturers including Hotpoint and Miele make matching pairs of tall fridge and freezer which can be fitted with a joining kit so that they give the appearance of being a single large unit opening from the centre like an American style model but give you the additional capacity and the added convenience of 2 separate units. 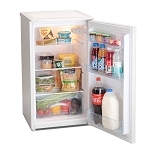 Under worktop size models are always popular in fridges and freezers and we stock a good range in sizes from just 48cm wide for the narrowest gaps up to 60cm wide. The most popular sizes we sell are 50cm and 55cm wide, if you are looking to replace yours please measure the available gap so we can find you the most suitable size.